Chances are you don’t operate your generator at full power and full temperature unless you’re experiencing an emergency. In fact, your generator may not be used frequently or only run on light loads throughout the year leading you to believe it’s in fine shape. Plus, there’s that saying- “if it ain’t broke, don’t fix it.” The truth is, generators need annual load bank testing in their maintenance schedule for 4 key reasons: to ensure reliable operation during a power failure, to prevent ‘wet stacking,’ to extend the generator’s engine life and satisfy NFPA 110. The last thing you want to find out in an emergency is that your standby generator cannot provide the full power you need from it. Load bank testing allows a standby generator to be tested and exercised to verify its overall reliability and its ability to run at its full rated kW output. During the load bank test, a Duthie Power technician monitors critical engine parameters such as: oil pressure, engine temperature, fuel pressure, etc. These readings are recorded to show that once the unit reaches full rated load, it runs at normal operating temperatures and pressures. Weekly no-load testing is how most generator owners exercise their standby generators. The problem with this practice is under-loading a generator can lead to ‘wet stacking’- when unburned fuel and soot accumulate in the engine exhaust. Wet stacking can manifest in black exhaust and pooling fuel oil, and it is damaging to the engine’s efficiency and life span. A buildup of wet stacking is also a fire danger. Annual load bank testing allows the engine to reach its full operating temperature so it burns out accumulated fuel and prevents wet stacking. This ensures the engine runs cleaner and more efficiently. Whether your generator is diesel or gaseous fuel-driven, and whether it is run lightly loaded or never loaded at all, most manufacturers agree yearly load bank testing is a must to extend your generator’s engine life. In fact, it is not just a recommendation, it is required by the National Fire Protection Association (NFPA) for buildings and facilities with emergency or standby power supply systems (EPSS). At Duthie Power Services, we offer load bank testing as a separate service. We can also structure it into a service contract to make it part of the yearly maintenance on your standby power system. 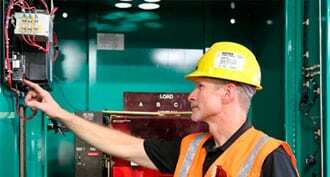 Load bank testing is not intrusive in any way, and there is no interruption to your facilities loads during the test. With this service, we provide a full report of the generator output readings for: voltages, amperages, kW amounts, and more. We take pride in having served Southern California’s generator needs for over 50 years, and we understand the value of longevity. Contact our generator experts today to schedule your load bank test and ensure the longevity of your generator.